From L-R Greg Melius, Jim Renfro, Dewayne Cooper, Dwight Steffler, Mike Machol, Steve Freemen, Rudy Guerrero, Michael Paul and Jason Gold. Even after 17 years as the NFL Game Clock Operator for the Houston Texans, the amount of effort required to host a game continues to astonish me. It all begins with the NFL’s Game Day Assistants (GDA). 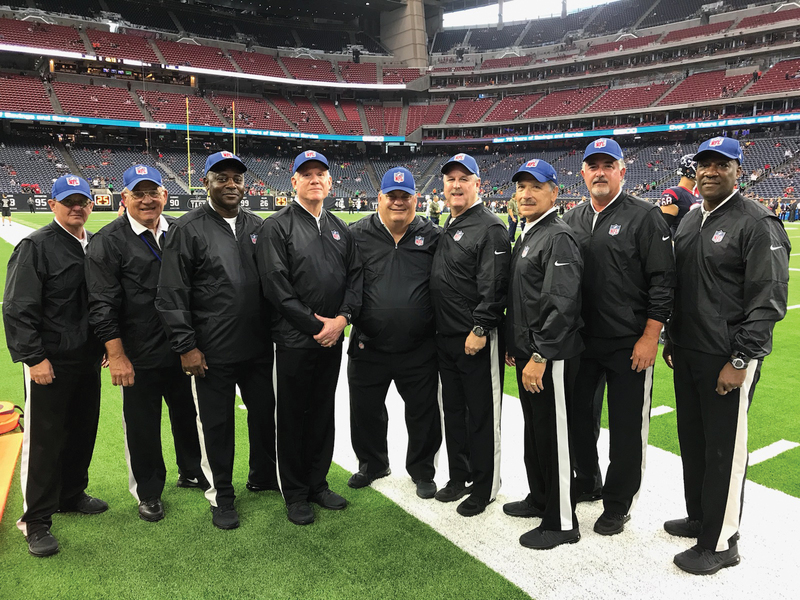 They are responsible for putting together the operations team of On-Field Game Officials, the Coach-to-Player Operator, a Game-Clock Operator, an Instant-Replay Communicator, the Instant-Replay Field Communicator, an Instant-Replay Field Technician, the Kicking Ball Coordinator, a Play-Clock Operator, a Video Operator, and the Chain Crew. The GDAs show up for the game four hours prior to kick off. They supervise the Operations Team as they perform their NFL checklist of pre-game duties. This includes a review of procedures and rules, and the inspection and testing of all communications and electronic equipment. Two hours prior to kickoff, the GDAs perform a dress-rehearsal simulating game conditions. This eliminates technical glitches and ensures smooth operations during each NFL game. The On-Field Game Officials wear the black and white striped shirts. They manage the game as officials, call penalties and maintain an orderly pace of play. One of the On-Field Game Officials serves as the Replay Official. The Referee is the fellow wearing the white hat with a microphone who announces pertinent information to the fans watching the game. The Coach-to-Player Operator manages the electronic communication between the offensive coach and the quarterback, and the defensive coach and linebacker. When the play clock countdown reaches 15 seconds, he presses a button that blocks the communication process. When the play is over he releases the button and the electronic communications are restored. This is repeated for each play throughout the entire game. The Game-Clock Operator runs the 15-minute clock for each quarter. He must be an expert about all the timing rules in the NFL. His responsibility requires intense focus on the game and all of the officials. He prevents time-outs from being called during periods when they are not allowed. As a backup, he must keep a manual, written log of all clock starts and stops. In the event of an electronic malfunction, the log serves to keep accurate time during the balance of the game. The Instant-Replay Communicator either initiates, or is called upon to look at a play for review. They enable electronic communication between the Replay Official and the Referee. His counterpart is the Instant-Replay Field Communicator. He is the person on the sideline with the headset and tablet who allows the game referee to see and hear what happened on the particular play in question. Footballs used on kicking plays (K Balls) are separate from those used on regular plays. The Kicking Ball Coordinator is responsible for all the K Balls before and during the game. On game day the K Balls are opened and properly inflated to the exact specifications of the NFL. Each team has a representative who prepares the K Balls under the supervision of the Kicking Ball Coordinator. The K ball coordinator will keep the balls with him at all times during the game. On kickoffs, punts, field goals or extra points, the K Ball coordinator will toss the ball to a Game Official who will spot the ball at the line of scrimmage. Once the kicking play is over the Game Official will toss the ball back to the K ball coordinator, who will place it back in a bag he wears on his side. The Play-Clock Operator duties are to run the 40 second and the 25 second clock. This job takes great concentration and laser focus. The circumstances of each play will dictate whether the play-clock should be reset to 40 seconds or 25 seconds. After a regular play, the play clock is set to 40 seconds. If there is an administrative stoppage (a penalty, timeout or injury), the play-clock will be set to 25 seconds. The play-clock operator will start and stop his clock according to the play or the Game Official’s signals. The Video Operator assists the Replay Official looking at replays to make review calls on the field. This is a very sophisticated system and requires electronic knowledge. The Chain Crew is an integral part of the game. The crew consists of eight people and a back up. This includes the down box man. He wears a red vest and holds the stick with the four numbers 1, 2, 3, 4 marking each down. Another crew member wears a black and yellow vest and positions an orange banner on the ground to mark the line to gain after each play. Two men who hold the chain, which is exactly 10 yards long. Another member of the Chain Crew places a clip on the chain for measuring first-downs when the chains are brought on the field. There are also people who chart penalties and plays which include down and distance. On the home side of the field are the other 2 Chain Crew the alternate down box and the alternate line to gain. The Ball Boys toss the game balls to the Officials when it is necessary to replace the current game ball. Usually this is done on incomplete passes and when the ball goes out of bounds. There are two Ball Boys on each side of the field to ensure smooth operations. These are just a few of the many people who help put on a NFL game. They are a dedicated and hard-working bunch. It is a privilege to work in the NFL. We all take our responsibilities very seriously, but enjoy ourselves immensely. The next time you watch a NFL game on TV, or at the stadium, I hope you will remember that what you are seeing is well choreographed because of the hard working men and woman of the National Football League.